Departing Ferrari Chairman Luca Cordero di Montezemolo had sought to limit total annual sales to 7,000 units a year to maintain exclusivity. 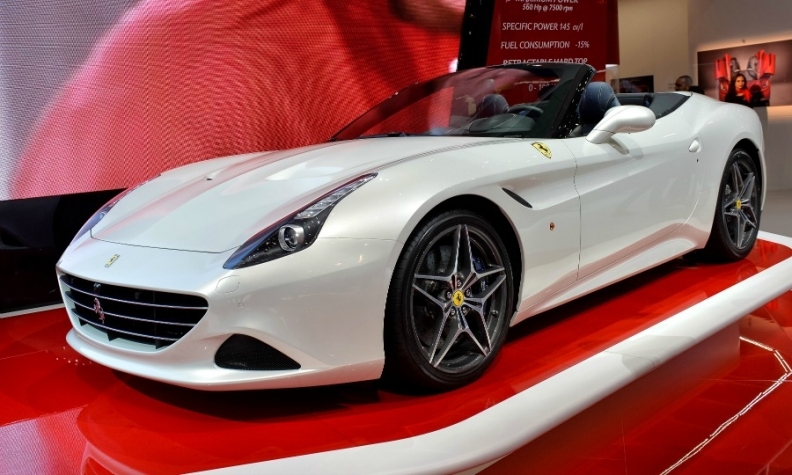 A Ferrari California T is shown. MILAN (Bloomberg) -- Ferrari will build more cars than previously planned after Sergio Marchionne, CEO of parent Fiat Chrysler Automobiles, takes the top job at the supercar maker next month. The plan contrasts with the strategy of Luca Cordero di Montezemolo, who resigned as Ferrari chairman on Wednesday after 23 years following a clash with Marchionne. Montezemolo wanted to limit the company's volumes to 7,000 cars a year to safeguard the brand's exclusivity. Marchionne indicated in May that the brand had the potential to sell about 10,000 vehicles annually. Marchionne, who will become Ferrari chairman on Oct. 13, said he plans to gradually increase production of vehicles like the $1.3 Million LaFerrari to keep pace with growing numbers of ultra-wealthy consumers. "If that class increases, we should be able to follow them," Marchionne said Thursday at an event in Balocco, Italy. Otherwise, "the waiting list will become too long, and people get tired." Ferrari, based in Maranello, Italy, is 90 percent-owned by Fiat and a key component of Marchionne's plan to expand in luxury cars following the merger to create Fiat Chrysler Automobiles. Montezemolo, who took charge of the unit in 1991, wanted to maintain Ferrari's autonomous status and not become a subsidiary like Volkswagen Group’s Lamborghini. "People should not underestimate the importance of Ferrari for the group," said Marchionne. "Structurally, in terms who we are as carmaker, they have and will continue to define us." Marchionne will take the top job at Ferrari on the same day that shares of the merged entity FCA are set to start trading in New York. The executive said today that while the group doesn't "technically" need to raise money to finance his 55 billion euro ($71 billion) expansion plan, FCA's new board will review options in late October. Marchionne added that Fiat is on track to achieve its 2014 earnings goals, helped by the sales of Chrysler in North America. The Italian manufacturer is seeking to increase profit by as much as 18 percent this year. To keep boosting earnings in the coming years, Fiat Chrysler plans to roll out more upscale models like the Maserati Ghibli sedan, which uses engines developed and built by Ferrari. While Marchionne says there are no plans to sell shares in the supercar unit, it isn't critical to the group over the long term. "Do I think they are essential to the configuration of FCA forever? The answer is no," Marchionne said Thursday. "But they represent the best of what a carmaker can be."